And the world and the world and the world. The government and ruling parties will begin considering whether tariffs on five categories of agricultural products that have been regarded as a “sanctuary” can be removed in tariff negotiations of the Trans-Pacific Partnership (TPP) multilateral trade initiative, in which 12 countries, including Japan and the United States, are participants, according to sources. The government and the ruling parties have treated five categories of products—rice; wheat; beef and pork; dairy products; and farm products that are used as sweeteners, such as sugar cane—as key product categories for which tariffs should be maintained. But now that the talks are facing difficulties, the government and ruling parties have to consider whether tariffs on some products in the categories can be removed. Koya Nishikawa, chairman of the ruling Liberal Democratic Party’s committee on the TPP, said Sunday he would consider removing items during his visit to Bali, Indonesia. "We have to consider whether [some products in the five categories] can be removed [from subjects for maintaining tariffs]," Nishikawa told reporters. Akira Amari, state minister in charge of TPP affairs, said Sunday in Bali, "It's helpful that our party will hold discussions," indicating that the government will start considering the issue in step with the LDP’s review. In response, LDP Secretary General Shigeru Ishiba told reporters Monday morning at the LDP headquarters, "Unless we put individual items into consideration, we will not be able to lead the negotiations to our advantage..."
Who would have ever guessed that up unto and through the July elections, where rural district votes outweigh urban and suburban ones at ratios up 5 to 1, the ruling Liberal Democratic Party would swear eternal protections for Japan's beautiful agriculture, only to turn around post-election and offer up those protections as a sacrifice in order to win a deal improving Japan's negotiating position in a trade pact Japan's large multinationals and major business lobbies see as crucial? Who would have guessed at this treachery? It is as if Abe Shinzo were beholden in some way to big business interests for his return to power (Link) -- and as if Abe and his Liberal Democratic Party were preparing for the possibility, however remote, that agriculture's inordinate and disproportionate influence on national affairs might be undone by a blow from on high. An aside - while reversing course on the sanctuary status of agricultural products may hurt Prime Minister Abe Shinzo and the LDP in the long run, in the short run, the person in pain is Minister of Agriculture, Forestry and Fisheries Hayashi Yoshimasa. It is Hayashi's job to protect the interests of Japan's primary products producers in the Cabinet -- and he is clearly failing as champion. That Hayashi would be hung out to dry does not come as much of surprise: he did run against Abe for the post of party president last year. Abe punished him for his temerity, giving him a portfolio destined to make him either decidedly unpopular or a laughingstock. Hayashi's predicament is not exceptional: the other LDP presidents-in-waiting who had the misfortune of running against Abe are in similar straits. Ishiba Shigeru, who defeated Abe in the first round of voting but did not gain the majority necessary to become president, received the consolation prize of the party secretary-generalship -- only to be shackled with the chaperoning of two women (and thus undismissable) sanyaku who detest one another other. At the same time the Cabinet and the Prime Minister's Residence have been surreptitiously gobbling up powers, instigating without announcement a more Westminister-like system of policy and party management, diminishing the importance of party leadership posts. 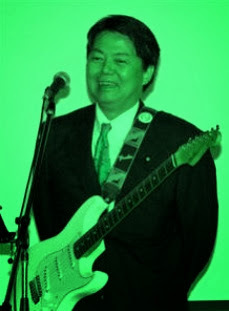 As for Ishihara Nobuteru, Abe appointed him Minister of the Environment -- and no one has heard from or seen Ishihara since. For opening quotations, the title of the work is almost always an active link. In this case, the song title links to a handheld recording of a 2013 live performance in San Francisco. Thanks for your own link, though. Ouch. I stand corrected, and can only say: "Well played, Sir."